713 Locksmith Houston is a company providing complete locksmith service to Houston, TX and surrounding areas. As our name suggests, we are located in Houston, and can provide you with convenient service because we are a family-owned and locally operated company. Such services include 24x7 locksmith service by our expert technicians. We provide fast and friendly responses to your lock emergency, repair, and installation needs, typically having a speedy response time. Licensed, bonded, and insured, we offer comprehensive locksmith service to local businesses. We also feature residential and auto locksmith services for homeowners and drivers. At 713 Locksmith Houston, our customers can get help with traditional mechanical lock repairs and installation, but we also install and repair magnetic locks. As the name suggests, magnetic locks, also called electromagnetic locks, use magnets as their main locking mechanism. A current of electricity is passed through one of the magnets in order to create a secure hold between the two magnetic plates. 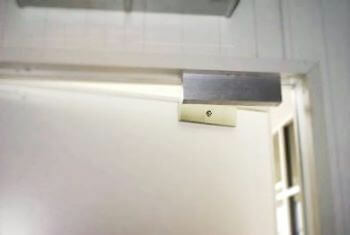 Magnetic door locks are ideal for highly trafficked commercial areas as no key is needed. We can install such locks at banks, government buildings, offices, shopping malls, supermarkets, and other places of business or commercial spaces. Our expert technicians can install magnetic door locks on many different types of doors using the very latest in technology and training. The different brands we use include Schlage, Assa, Kwikset, Kaba, American Lock, Yale, Baldwin, and more. Furthermore, we are happy to answer any and all questions our customers have about the installation of these locks pertaining to their commercial security needs. Moreover, all of our technicians have not only completed vigorous training but they are also licensed, bonded, and insured so you can feel secure not only with our products and services, but also the people you are letting into your place of business. As with our other locks, our technicians can help you with various issues that you may be experiencing with your magnetic door lock. We can also install multiple magnetic locks throughout your place of business. Additionally, we are able to provide advice about general business security. In the event of malfunction, damage, or some other need to repair the lock, you just need to make an appointment with us so that our technicians can repair your magnetic door lock, as quickly and inexpensively as possible. Our competitive and upfront pricing allows our customers to make informed decisions about the best company to service their magnetic door locks, no matter how simple or complicated. As always, we provide 24x7 locksmith service to our customers. Why Should Your Business Use 713 Locksmith Houston for Your Magnetic Door Lock Needs? We have 5+ years of experience providing fast and friendly, mobile locksmith service to Houston, TX and surrounding areas. So, when you need to install or repair nearly any kind of lock, including magnetic door locks, think of our company. We offer complete locksmith service and have upfront pricing so you know how much the service will cost without any guesswork. Our mobile locksmiths are able to meet and surpass your business’ security needs. Our thorough approach to safety and quality service is the reason why we are the most recommended locksmith in the Houston, Texas area. In the 5+ years in which we have been in business, we have built a reputation for genuine customer care, quality service, and quick response time to emergencies. Let us prove to you our commitment to quality the next time you have a magnetic lock repair or installation need, or a lockout. We can be reached 24 hours a day, 7 days a week, including holidays. Installation and Repair of Magnetic Door Locks http://713locksmith.com/magnetic-door-locks/ 2.8/5 based upon 13 reviews.